If you ever watched the movie "Little Giants" (or have ever heard the quote) you know that it's been said football is "80% mental and 40% physical." While math has never been a strong suit of mine, attending the Indy Eleven - New York Cosmos game illustrated to me that soccer might be 90% mental and 50% physical. That's not to say that soccer is a more challenging and demanding game than the American football counterpart, but rather to illustrate how clubs can easily play themselves out of a game. Indy Eleven and New York Cosmos have met six times before Saturday's clash on the campus of IUPUI. All six matches had high points and low points but the common thing was that all six matches were draws. That being said, whether it was the faint smell of beer in the air or wine from Indy Eleven's "Wine and Cheese tasting" night, the build up to the clash of titans was nothing short of monumental. It was clear, from the New York Cosmos fans who had staked claim to a section of the stands (and lit a smoke bomb off before the game) as well as by the supporter's sections for Indy Eleven. Results were coming, whether we liked it or not. Tim Hankinson, either adjusting for the Cosmos or seeing the difficulty the team was having moving the ball up on the wings or in the middle, left the ever popular 4-2-3-1 formation which saw Duke Lacroix, Ubiparipovic, and former Sacramento Republic star Justin Braun line up behind Eamon Zayed in favor of a more classic 4-4-2 which saw Braun slot in beside Zayed. Remember before when I said that the game might be more mental than physical? The first half was Indy Eleven heavy. Even though (statistically) the first half possession percentage favored the visiting team, Indy Eleven had played the best 45 minutes of soccer in three years that didn't finish with a goal. They were confident, they were cool. They moved the ball up smoother without having the issues the 4-2-3-1 presented. The change in formation (and the choice of substitutes) based on the statistics from the North American Soccer League's website show that the average position that Eleven played against the Cosmos allowed for better ball movement as well as more chances on goal. First half is the reason you sign a player like @justinbraun17. Guy has been great. Here's Niko Kranjčar's first #NYCosmos goal. Calm and collected from the spot. New York came out swinging. They were done feeling out what Indy was doing and wanted to start throwing haymakers. They came out and closed down on allowing Indy easy passage and build up on the offensive side of the ball. This is where mentally, Indy struggled. 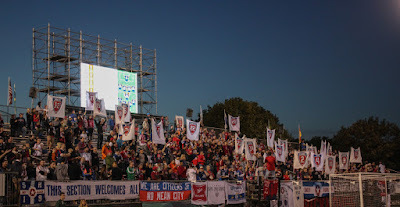 They didn't have an easy first half but New York had absorbed so much even if Tim Hankinson cooled them off, Indy Eleven out and got outplayed by the Cosmos drawing fouls and cards and helping build up their attack. 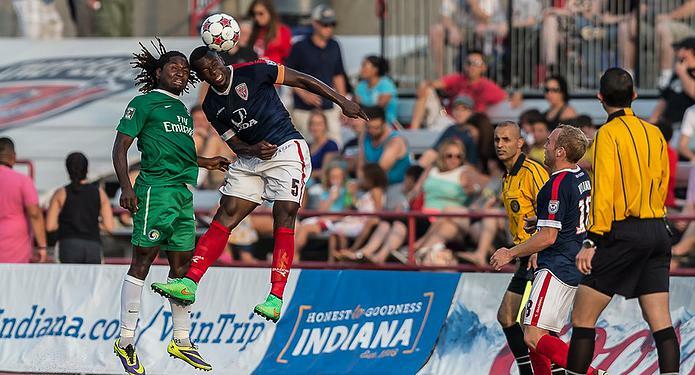 Saturday was the first sign of a new era for this young Indy Eleven franchise. Tim Hankinson has done wonders since coming in and questions and slowing being answered as to what will come from the roster this season. Regardless, Saturday Night at The Mike was special. And we all celebrated with you, coach. After nearly 40 minutes and refreshing, seeing the same bank commercial (did you know a dog takes about 28 seconds to brush their teeth?) and a brainwashing level of New York Cosmos ads, the group I was watching Indy Eleven's 0-0 draw with Tampa Bay joined the game 20 minutes in. The game itself was filled with firsts. First time Tim Hankinson lead the boys in blue in a competitive game. The first time we saw players like Lovel Palmer, Jon Busch, Ubi, and others. And, the first time we got to see the much antisipated "4-2-3-1" formation that was mentioned by Hankinson shortly after the announcement of his hiring. 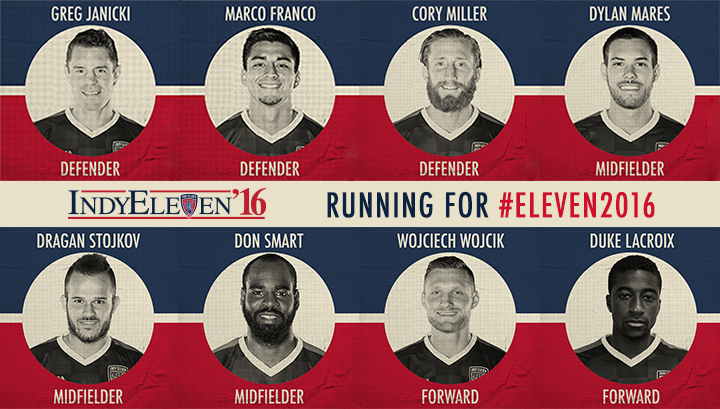 Your first Indy Eleven Starting XI of 2016! Tampa held almost 60% of the possession to Indy's 40. Indy Eleven had 24.4% of their passes be long balls. Tampa Bay was more accurate with their passes. Tampa Bay Rowdies had 12 total shot attempts (including those that were blocked) to Indy's six. While neither team was very accurate in those shots Indy gave up a lot more on their attack and lacked any presence of mind when attempting counter attacks. Five players seemingly with little background together (minus Jon Busch and Lovel Palmer's Chicago connection as of recently) formed what I called "The Great Wall of Indy." They seemed confident, they seemed calm, they seemed patient as Tampa Bay's attack caused them to go out and buy a new kitchen sink just to throw it at them. It was a real sense of togetherness that was actually the highlight of the match if you were an Indy fan. Greg Janicki, who played for Hankinson in San Antonio the first year the club played in NASL, was the only player who was truly familiar with a Tim Hankinson style of play. But what you saw Saturday night was a defense that knew what they needed to do and nothing more than that. For me, the player of the game had to have been Lovel Palmer. Countless times his tackles were the keys to stopping counters by Tampa. While the draw wasn't ideal, it is for the circumstances surrounding the match. First match of the season, away, playing a very high power attacking team that is led by one of the top goal scorers in Tom Heinnemann. The result of not only getting a point but holding a team who seemingly should have scored two to three teams should make fans thrilled. The club opens Michael A. Carroll stadium against Ottawa Fury which should be as interesting of a game on the fiend (with three former Fury players starting for Indy Eleven) as it is off the field. The one bit to takeaway from Saturday's draw is that as long as that backline success by Indy Eleven wasn't as much to do with Tampa Bay's jitters as it was with the actual quality of play by Indy Eleven, goals will surely come from the new look Indy Eleven. With NASL's season right around the corner and Indy Eleven gearing up to begin their third season the expectations for a team which was built around the word "experience" has given fans a sense of excitement. Indy Eleven is being touted as a "playoff team" by outgoing president and general manager Peter Wilt, and with a solid mixture of MLS, NASL, and USL talent Indy Eleven SHOULD do well in the North American Soccer League in 2016. Just not in the Spring. Now I am perfectly willing to eat my hat, but the voice in the back of my head (the same voice that usually demands coffee every morning) has me hesitant to jump onto the Spring Season train. With as many new names in and a general even mixture of names from previous seasons the biggest issues from previous seasons seems to be glaring from the dark corner of the room. With Eamon Zayed, Justin Braun, Duke Lacroix and other attacking minded players Indy Eleven will surely be able to score goals (though some of the preseason results have shown otherwise). With Brad Ring, Sinisa Ubiparipovic, and other midfield players the pace of the game should be controled. And with the talent in the back and more direction and systems in place the defense looks solid. The question that still haunts my mind from last season wasn't lack of fire power. It wasn't a lack of control in the midfield and it certainly wasn't issues in the defense. It was the winger bringing the ball up knowing where the forward was going to place the ball. It was the central midfielder back tracking to support the defender and being able to know where he needed to go in order to best stop the ball. It was the forwards finishing a shot in front of the net. Regardless of results of the preseason. Regardless of players who come in and out during the season. Regardless of everything that goes on BEFORE the season starts two things for Indy Eleven should be shown very quickly in order to get a good start. Fitness and team chemistry. As great as Indy Eleven's offseason as for player acquisitions some of the other clubs were a little more successful, with Minnesota United grabbing Lance Laing, solid loans of Bernardo Anor from Sporting KC and Damien Lowe from Seattle Sounders. With Tommy Heinnemann joining the Rowdies in Tampa Bay and Miami FC and Rayo OKC not being shy in bringing in big names it's been both an exciting and nervous offseason for many fans around the league. Before I go on anymore, let me say that the additions Indy Eleven has made are all very solid choices. Hankinson addressed the needs from last season very well and I think this will be the best season yet. All that being said, Indy Eleven are a fall season team. In a league like the North American Soccer League it's increasingly important to blend early and get results early. 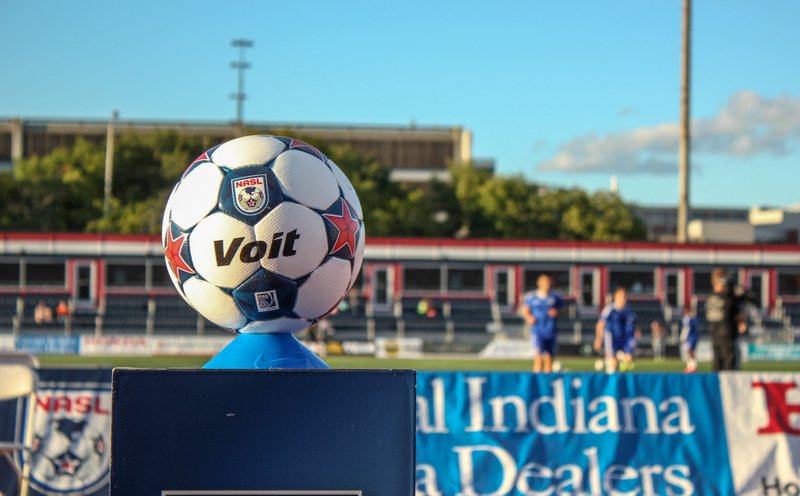 These two things have eluded Indy Eleven since their first season. With the roster additions, I foresee another slow start at least for a few games as the new systems, new players, and other new aspects to the club come together in game time play. In terms of predictions, I think Indy Eleven is a midtable team in the Spring. A midtable team in the Spring who should be a playoff team in the fall. I think the issue will be how quick they click and how soon we see the potential that this team has been stressed to have. 2016 is sure to be a great year for Indy Eleven but it will be how fast they get out of the gate as to whether they are another underachieving team or we see them grow into a playoff team in the north American Soccer League. On the cusp of the 2016 season for the North American Soccer League, Indy Eleven fans are growing with expectations as the club has found it's first real direction under the tutelage of "the Tims" Tim Hankinson and Tim Regan. And as Peter Wilt fades north to help create another soccer club in Chicago NASL, we begin to see Indy Eleven's public perception honeymoon period begin to dissolve. It's time that expectations get real for a club who has had the capability and opportunity to capture magic to not let anything slip by. That's not to say that anything short would be a failure. A success in the US Open Cup could equal the same results but Indy Eleven needs the results to come in to help pus them both on and off the field. The shape on the field should create both goals and victories. The key early on will be what plagued the boys in blue all season and that's building team chemistry early. I feel as if that as the largest issue the entirety of season two due to the injuries but the injection of quality but midseason loans of Dane Richards, Zach Steinberger, and other signings. Indy Eleven had no issue putting quality on the field but one of the most underrated portions of any club seems to be team chemistry. A lot of the misses in terms of passes and play buildup were players just not knowing where someone was heading towards. Part of that is the communication aspect but you also can get a keen sense of how teams are looking based on the chemistry between players. It seems like that shouldn't be an issue with a team built and built early but it's something that on the field Indy Eleven will need to maintain in order to negate silly mistakes coming about. 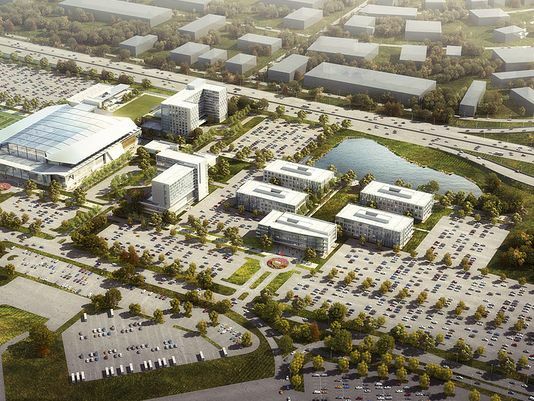 Unless you don't live in Indiana(opolis) or you might live under a rock, the news of a stadium/medical facility going in at the location of the old Indianapolis International Airport broke a few weeks ago. A link to the story is here but one quote comes out from that story that is key. Mario Rodriguez, airport executive director, said the medical complex would be privately financed and no subsidies were being sought. Stadium For Indiana has been a long term for Indy Eleven even before the team had their first touch at Michael A. Carroll stadium on the campus of IUPUI. The key portion of their plan for the stadium though seems to be the "use it pay for it" model that would also be packaged with a hotel located near by the stadium that would be built by Erzal Ozdemir's construction company. The issues with this come both on and off the field that conflict with the building of the stadium. Up a bit north of Indiana is a team joining MLS. Minnesota United. While it's still being discussed in terms of location and other legal aspects the funding will be what every member of state government likes to hear. Privately. And that is glowingly becoming the method that clubs are having to fund stadium and stadium renovations is by private funds. In the Indianapolis market it's all to clear that private funding is the trend when you have a large NFL stadium that was build almost completely with public taxes and has been a headache in terms of financing. Having followed Indy Eleven as well as the state governments movements in terms of finding funding for the stadium, it's becoming more and more clear Indy Eleven's goals are to not put a dollar into the stadium, have the state as well as the city help finance it and run it, but Indy Eleven collect the profits. Look, I want the stadium. Indiana is gaining the edge in terms of a growing as a soccer market and being smack in the middle of Columbus and Chicago, it's a perfect geographical rival for the two MLS teams located off those interstates but a funding for a soccer specific stadium or any stadium for that matter is something that has to be at least moderately privately funded. While it didn't make it through the process, signs showed that public funding was available in forms of grants for the club to get work done to their current location on the IUPUI campus. It wasn't a lot, but it is the beginning relationship between the state and the club in building a new sport in the land of basketball and football. But what will help make the case for public money being used to help build a stadium? Wins. Wins. Wins. A lot of the state legistatures looks at the North American Soccer League with a twinkle of disgust in their voice. "Second division" and "minor league" got tossed by a lot of state legislatures who really had no understanding of the sport let alone the landscape of the current US Soccer pyramid. Regardless, the most transparent part of any sports teams and how success should be drawn is by wins. Teams are reporting, physicals are being taken,scrimmimiages are being played and with that comes the build up to season three for Indy Eleven in the NASL. If you haven't followed along, this will probably be the biggest season for Indy Eleven both on and off the field. Expectations are high(er) than previous and with Tim "Nature Boy" Hankinson coming in to the HC spot the roster moves show Indy Eleven want to make the next step. Here is the roster as it stands (from Indy Eleven Dot Com) and above is my projected starting roster for the first game of 2016. Shortly after arrival, Tim Hankinson made it pretty clear that while it's not set in stone that the club would shift from what was normally a 4-4-2 structure (4-4-2 diamond...narrow... you get the idea) to a new formation of 4-2-3-1. What this does is pull a forward back, moves two of the wingers up and with Hankinson's system, push the backline flat. Normally we saw a lot of overlap with Franco and Hyland crossing over to play up in the wings which could occasional leave that gap open for a counter but with this the defense can focus on defense and offense focuses on offense. Zayed will probably play some mixture of a poacher or an advanced forward. While (at least from the beep test) it seems Braun has the speed Zayed has the goal scoring ability on his side. I think if he isn't played there that Justin Braun starts for the boys in blue. I'm interested as to what this means with using three advanced midfielders. Indy Eleven seems to have gone out and gotten an arsenal of fire power and as Tim Hankinson has stressed "experience" in attacking roles. In terms of the three players behind Zayed, there's a fairly good chance you see Mares return to the starting lineup. Dylan Mares, an IU Soccer product, played out of his MIND last season and may have carried the offense at times playing in a playmaker type role out of the midfield. I like him to play on the left or right as I do see Ubiparipovic (spelled correctly the second time) to slot in behind the forward position and help shadow the striker. Mares on the right in this lineup can help be a winger, dip inside, and play balls in from the wings. In the central midfield, Indy Eleven obviously liked it so they need to put a Ring (I'm sorry) on their central midfield spot and I foresee both Brad Ring and newcomer to Indy Eleven Gorka Larrea to help hold the midfield. My favorite plays are whenever we get to see Brad Ring spring into support for the attack like a bat out of hell but I think between him and Larrea, who is very strong in marking and closing down that will secure the midfield and pump the ball up. No shying away from the changes, I expect a huge difference in terms of the back four. I don't think anyone will be yelled at for helping the attack but Hankinson wants to see a more compact solidified back four and for me that makes a fair amount of sense. I think the two backs will help move the ball when needed, but I do like the idea of a full defensive presence when combating attacks. Starting on the left, newly signed Stephen DeRoux makes my list. DeRoux and Palmer, who I think starts on the right) are new comers to Indy Eleven but both have the ability to play the ball as well as help shield the attacks from getting painful. Central defense is where things could get interesting. One of the glaring questions in aftermath of roster cut day in the off season was why Greg Janicki was retained by Erick Norales who was the largest anchor short of Mares for the team, was let go. Janicki played with Hankinson with the now departed San Antonio Scorpions and has marking ability. I think for what Hankinson sees as the defense's role Janicki can cover behind the line and really clean up any through balls and help close down on attacks. Next to him can be a number of people but I think Colin Falvey makes the spot and helps Janicki by playing the ball up more and trying to make the workload low if at all possible. The goal keeper spot is a coin flip. Cardona has the upside and youth but Jon "Ironman" Busch has the experience, ability..and apparently incredible balance. Side note, my knee magically started hurting after watching that. Damn! Regardless of the lineup, I think between the Front office, the fans, the team itself, and many within the league that this season will need to be the season we see more than just a lower/midtable finish. The ability is there, the scouting is done, the tactics are being practice. It's time we get results. Adding Lovel Palmer (and two more signings later on as of this writing) that are being built up as larger names as well have been clear indications that Indy Eleven is preparing to go the distance and (at least) qualify for their first playoffs since forming as a professional team three seasons ago. But as the names pile up and new head coach Tim Hankinson begins to start training camp in Arizona, questions are forming off the field. Earlier this week it was announced that Peter Wilt will be moving to a consultant general manager as he begins work on launching another soccer team back in Chicago. 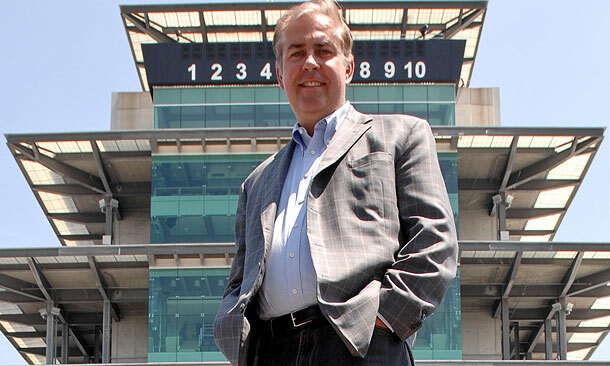 Replacing him at the Indy Eleven throne is former CEO of the Indianapolis Motor Speedway, Jeff Belskus. 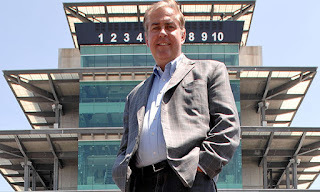 Belskus comes with a load of political knowledge and networking as well as the business acumen that comes with someone involved with putting together one of the largest motor races in the country. Belskus doesn't shy away from the fact he isn't a "soccer guy." Belskus has a well deserving resume regardless if the obvious lack of background in soccer brings concern to your mind. What Indy Eleven will run issue with is the idea of replacing a name rather than the ideas. Belskus mentions in his interview with Jack Ball on NASL's website that Indy Eleven will be hiring someone for general manager who does have the soccer knowledge. But what is concerning is the idea you can simply replace what Peter Wilt has been able to do with someone else. Wilt, who helped elevate Chicago Fire and has experience with teams in Milwaukee brings a hair of experience both with dealing with a specific market but also being able to work with soccer minded people. It's been made clear that Wilt will stay to help work with Belskus integrate into the sport but when the next rung on the ladder doesn't have the same length of experience, how do you know he will be the best filter for important decisions like loans and what players to bring back at the beginning of next season? I won't begin to speculate who could end up with the general manager tag. The only hope is that this person is brought in before Wilt departs for Chicago around the Spring of 2016 so there is a smooth enough transition from leaders. The hire of Belskus is also a statement by Indy Eleven owner Ersal Ozdemir about what the main objective is business wise for Indy Eleven is in the next 2-3 years. A stadium (as well as a divisionly tied boost in attendance perhaps) are what stand between Indy Eleven and a soccer stadium. Indy Eleven have been pushing since before even taking the field for funding to develop a stadium. The latest attempt (submitted on purpose) involved 80+ million dollars of funding that would be supported by the "if you use it, you pay for it" funding system as well as back up funding from a hotel built near the stadium by Ozdemir. 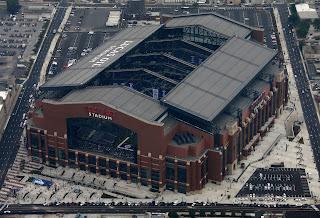 Indianapolis current funds through taxes and other public funding a professional AMERICAN football stadium that rose in cost a year or so after it was built. This, along with previous stadiums built have tax payers around the state a little... unenthusiastic to let lawmakers pass any funding. An attempt almost made it through that would see some 20 million get passed to allow for much needed renovations for the Eleven's current home on the campus of IUPUI with Michael A. Carrol stadium. Look. I'm a fan, but I take my fanship out of this and have to be honest. There is no way right now that the state (or city of Indianapolis which the club is in talks with for more funding) gives much more than the bonds that were issued at this point. While this discussion is being taken place between two sets of people who have different views of it, when you look at the economic makeup of the stadium being constructed in Minnesota and how much of it is being publicly funded how does it look for lawmakers when a publicly funded stadium is being pushed here? While it won't be exactly as profitable for the club, one idea that I've kicked around is playing games in Lucas Oil Stadium. I'll let you finish your argument in your head as I say that yes, the field would be in poor condition compared to a soccer specific stadium. Yes, the seats wouldn't be as full as they would for an Indianapolis Colts game. You also have to map a schedule around the NFL which MLS already does with Seattle Sounders but it would be a home, you could probably alleviate the "minor league" stigma that sits around general fans who read about the North American Soccer League and get out of The Mike to allow yourself more leverage building up towards getting a stadium. Christmas is the time of the year where children take into account their year and throw together a list of things they want from Santa this year. Whether you celebrate the holiday or not, at some point something you celebrate has you list things you want or need. Even if it's just a list to the grocery store, we all make lists of things we want or need. 24 hours after naming Tim Hankinson head coach last week , Indy Eleven announced the 8 players from the 21+ the team had by the end of the season that they would retain. Eight players have seen their contract options picked up by Indy Eleven for the team’s third season of North American Soccer League play next year: defenders Marco Franco, Greg Janicki and Cory Miller; midfielders Dylan Mares, Don Smart and Dragan Stojkov; and forwards Duke Lacroix and Wojciech Wojcik. “Indiana’s Team” declined to pick up options on eight other players: goalkeepers Jon Dawson and Kristian Nicht, defenders Judson McKinney and Erick Norales and midfielders Marvin Ceballos, Daniel Cuevas, Kleberson and Victor Pineda. Two players, defender Kyle Hyland and D/M Daniel Keller, have seen their contracts with the team expire, while Indy Eleven is continuing contract discussions with two other players, goalkeeper Keith Cardona and midfielder Brad Ring. In addition, loan arrangements with six players – defender Jaime Frias [C.D. Guadalajara (Chivas), Mexico]; midfielders Sergio Peña (Real Sociedad, Honduras), Dane Richards (New York Red Bulls, Major League Soccer) and Zach Steinberger (Houston Dynamo, Major League Soccer); and forwards Brian Brown (Harbour View FC, Jamaica) and Charlie Rugg (Los Angeles Galaxy, Major League Soccer) – have expired. Hankinson has made it pretty clear that while these eight are retained, that "one or two of them" could be starters on the field. Of note on the declines of options would be Erick Norales. Norales was a staple of the "NASL Team of the Week" and outside of being suspended for three games as a result of two red cards during the season he was a constant goal threat and help marking men on the run. - Erick as your departure from the club Indiana Eleven, which were part several seasons and helped build a new professional team is given? "Well there coaching change, with new plans and new expectations for the club and a decision is made. The truth would not think, my plans were to continue, but this is football. Very grateful to the institution, and very happy so I made personally, but not with the results collectively. " It's unclear his next destination, with many saying not to rule out retaining his location in the States, but I wouldn't be shocked to see Norales return to Honduras or otherwise so he can even be brought back up for the Honduras national team. Other departures, like Hyland, seem more based on the tactics of Hankinson citing that the backline will probably play a "flat four" which leaves Hyland high and dry as he typically led attacks on the wings. Pineda, Ceballos, and others seem really just based around the tactics the team will be using and the changes that will be coming for the club. Re-sign Brad Ring. Both Ring and Cardona (as reported) are in contract talks but between both Ring not only fits the mold of "experience" that Hankinson is after for this year's team, but Ring has also been steadily the best player on the field for Indy since year one. Ring can provide a great bit of play building and confidence in the midfield, but if Mares makes his way back to the starting lineup in that attacking mid role he held in the beginning of the season, he and Ring are great to build off of each other and help each other. Hankinson needs to establish his "plan" tactically by the first game. Hankinson has said no wrongs (per Bloody Shambles column) but really, what head coach on the new job won't say what he's said? He's credited the fans, the culture, and the club as his reasons for taking the job but in reality it's December. I'm remaining cautiously optimistic but by that first game we need to see a real difference in the style and feel of play compared to the previous two years. I'm not crazy enough to say "We need to see a WIN!" but Hankinson needs to back up his talk. Avoid bandaids on bigger wounds. One of the issues that this club ran into was putting small fixers on bigger wounds. Cuevas, who eventually broke his leg after his first game and Ceballos came in and provided, but weren't ever going to be long term solutions for the club. In a league where your turnover roster wise can anywhere between five or six to twenty players you need stability. Avoid the quick fixes unless there is a long term vision behind it. Bring back Steinberger. Financials aside, that is arguably the most logical and realistic loan deal that can be done again in year three. Rugg has had his option declined by LA Galaxy as has Dane Richards but Steinberger provided more compared to all of the loanees short of Richards. Houston also just traded away for three big named MLS midfielders, so Steinberger would otherwise get lost in that set up. 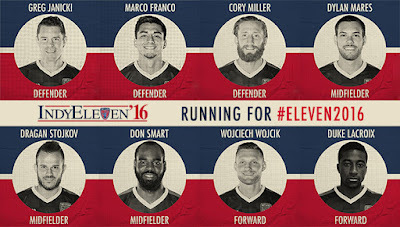 Finally, in regards to roster building, Eleven need to bring players in who can support the starters. That seems odd to write, but at some points during the year we had 13, 14, even 15 fringe starters who were rotated out which in reality, isn't bad, but you then run into the issue of chemistry when you are constantly rotating players around. Bring in 12 guy who could be rotated around, but after that support the spine of your team otherwise team cohesion will again haunt a team with around 30 goals last year. 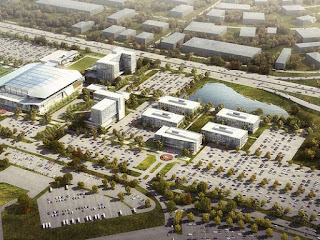 In reality, the moves Indy Eleven made were needed. Losing players like Norales, Hyland, and even born leaders like Nicht hurt the fans who have followed the club since day one, but Hankinson has made it clear that he is here to right the ship and will be grabbing the issues this club has faced on the field in the last two years and pushing them away. For now, we can just speculate. Judgement on moves comes in January when the club really takes form and we get to see what identity they will have.